Return flights to Bangkok from Germany, Paris, Baltics, Dublin or Brussels €399! Super cheap flights from Paris to Los Angeles or San Francisco from €214! Direct charter flights from Amsterdam to Cancun in Mexico from €379! Return flights to Bangkok from Germany, Paris, Baltics, Dublin or Brussels from €399! Oneworld carrier Finnair offers good price from selected European markets to Bangkok when traveling in first half of 2019. Flights have usually very short layover in Helsinki on your way. Looking for quick but cheap option check out below details of our deal to Thailand when departing from main airports in Germany. Paris, Vilnius, Riga, Dublin, Brussels or Amsterdam. Rooundtrip flights are available alreayd for €399 incl. all taxes and fees, meals and checked luggage. If interested you need to look for flights when all travel is complete by 30th of June 2019. Max stay 1 month. Finnair offers discounted flights for bookings made by 27th of March or until the cheapest seats last..
Travel dates. : We recommend to firstly compare the cheapest flights at Google Flights or directly with Finnair. Google Flights tool offers you almost instant result and you can easily browse throughout all the months. You can then book this deal directly with the airline or your preferred booking agent. 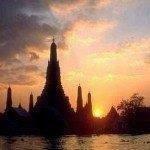 Need affordable hotel in Bangkok book your accommodation via Booking.com or Hotels.com. Booking sample of return flights to Bangkok from Germany, Paris, Baltics, Dublin or Brussels from €399! As per our above link to the deal your outbound flight from Frankfurt to Bangkok would be on Sunday, 10th of May. Return from Thailand back to Europe two weeks later, on 26th of May 2019.